I am now the proud owner of a Wüsthof Flexibel Fischfiliermesser 6" 4516/16cm made in Solingen, Germany. Otherwise known as my new fish filleting knife. I have already put it to good use slicing up an enormous side of smoked salmon, from Moidart Smokehouse, kindly gifted to me (oh, and my wife) by one of my brothers. 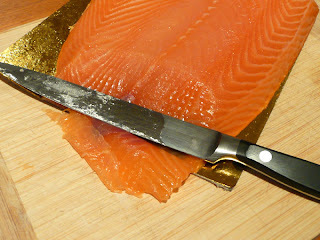 Who would have thought that slicing up smoked salmon could be such an enjoyable and calming experience? I must be accessing my inner surgeon. And where would the surgeon be with a blunted scalpel or enormous cleaver in place of a precision instrument? Private practice probably, charging a Harley Street fortune for ironic dark-ages-style operations. Sorry, I digress. We have been eating the salmon every day since Christmas day - usually just with some lemon juice and black pepper. But I have also tried it to great effect on oatcakes with some cheap (Lidl) caviar. I'm intending to have some tomorrow, mixed in with soft and creamy scrambled eggs but I'd better wait and see what state of health the morrow brings before committing to such an endeavour. I'm not one for making any New Year's resolutions but I can say, with some certainty, that I will be collecting, buying and generally acquiring many more gastronomic delights to dissect and deliver to you in a (very fine to the point of translucence) slice-of-life manner.